Pico de gallo is funny just because its literal translation in English is “rooster’s beak.” But rest assured, there’s no beak involved here. There isn’t even any chicken involved. 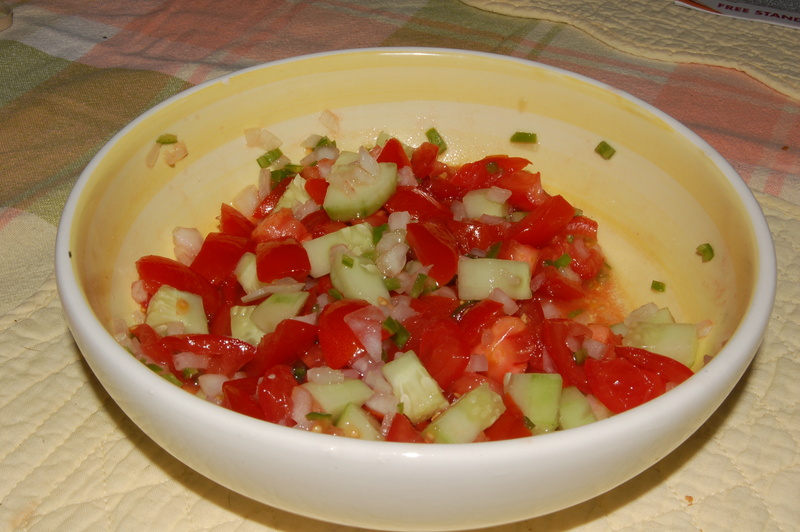 Pico de gallo is actually a salad made primarily of tomatoes, onions and chilies, though other ingredients can be added as well. Pretty much you can just think of it as a less liquid-y salsa. This is our version of pico de gallo. In a medium bowl, mix all the ingredients until well combined. Use immediately, or store in the fridge for about a week. You can use your pico de gallo on nachos, in burritos or tacos, or as a topping on chicken. It gives a nice freshness to whatever you use it in and just tastes yummy. Posted on July 30, 2014, in Etcetera and tagged easy, gluten-free, healthy, recipes, tomato, vegetarian, veggies, yummy. Bookmark the permalink. 4 Comments.